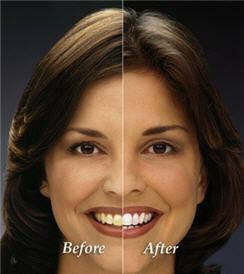 ZOOM bleaching is an in-office bleaching procedure that lightens and brightens your teeth in just 45 minutes. This procedure can be done on your lunch hour! Teeth are desensitized with a special fluoride toothpaste before your appointment. Most patients have a 7-8 shade difference by the end of the appointment. This is a great way to bleach or jump-start your bleaching. Home kits are provided with this bleaching procedure to either continue bleaching at home for a lighter shade or use as your teeth need a touch-up.